It may be challenging getting students to follow directions and listen, especially coming back from winter break. Try this fun listening skills activity in your classroom to catch their attention. 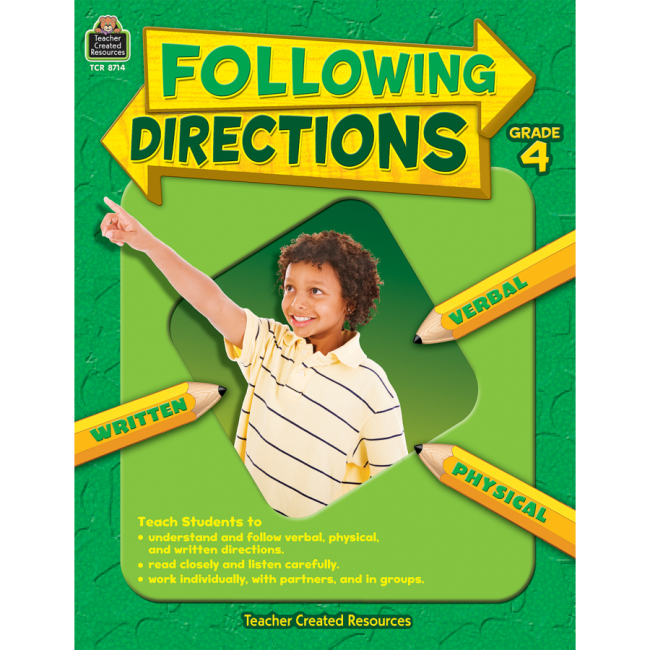 Directions: Explain to the class that you are going to do an activity to practice listening skills and following directions. Students need to be sitting where they can easily hear the teacher. Students might also need to move, so remind them to clear off their books from their desks before beginning the activity. Read each statement below slowly and clearly. Tell the students you will not repeat directions for this activity. Students should listen to what is being read, think about what should be done, and then react to what has been read. Remind students they should continue with each direction until they are told to stop and move on to the next direction. Be sure to check the answer key for each correct response. If the current month we are in has 31 days in it, then stomp your feet twice. If it doesn’t, then snap your fingers twice. Something Extra: On a separate sheet of paper, create more “listen, think, and react” statements about topics you are currently studying in class. For more Listening Skill Activity Pages, download sample pages from Following Directions. Susan Mackey Collins is a veteran teacher who has taught at both the elementary and middle school level. She currently teaches 6, 7, and 8th grade Advanced Language Arts outside of Nashville, Tennessee. She has authored many books for Teacher Created Resources including Cursive Writing Activities, the Discovering Genres Series, and many of the titles from our popular Mastering Skills Series. I am convinced that the main goal of teacher training each summer is to remind those of us who do not have to sit in a student desk each day just how hard it is to sit in a student desk all day. One of the things which has always fascinated me about professional development days is where we hold our meetings. Sometimes we sit in classrooms in those small desks that were made for people much smaller than the adults that fill the room. Other times we sit at the cafeteria tables of our school – you remember those tables, don’t you? Those little, round pedestals with the seats that squeak every time you move – the seats that have no backs on them so you can never lean any way except forwards for fear you might slide off. By the end of the six hours I have very little that feels professionally developed, except parts of my body that have been professionally developed into unnatural positions, and honestly, all I want to do at the end of those days is find a place to “unkink” all my kinks. Have I learned anything? Only to remind myself to bring a pillow next time or to call in sick. But, don’t think that I don’t think the developers of these days are clever; they are more than clever. In fact, I believe this is all what I like to think of as their master plan. There is a reason behind the hours of torturous seating…the true genius of the plan is it is now emblazed across our minds just how amazingly hard it is to sit still all day. Thus, through the genius of professional development, our students are saved. How’s that, you ask? Well, research has shown over and over that the attention span you have with your students is about (give or take) one minute for the children’s age. So, as a typical middle school teacher, I have about 12 to 13 minutes of my students’ undivided attention before I start losing them. That, compiled with the already uncomfortable seats they are forced to endure all day, makes any master teacher know that after a certain point in the lesson, a good teacher will let the students do one important thing: move. And, once I move them, I once again gain 12 to 13 more minutes of their undivided attention. It’s an amazing cycle, really. Now, I realize all transition in learning do not have to involve moving. A teacher can simply create a transition of activities and still maintain the children’s attention, but I maintain that for the health and well-being of those students who are trapped in those torture chambers of flawed ergonomic design…we teachers, as caring individuals, must let the masses move. •	Take an exercise break. Give your students a minute to stand up and stretch or do jumping jacks. The one minute of movement will be a definite payback in the time you’ll gain on their attention spans. •	Divide the students into small groups to continue the learning standard. •	Allow students to take a clipboard and work sitting somewhere else in the room instead of at a student desk. •	Have your students answer using motions. For example, stand up if the answer to a question is false. •	Allow individual students to stand up when called upon to read. Susan Mackey Collins is a veteran teacher who has taught at both the elementary and middle school level. She currently teaches 6, 7, and 8th grade Advanced Language Arts at Sycamore Middle School outside of Nashville, Tennessee. She has authored many books for Teacher Created Resources including Cursive Writing Activities, the Discovering Genres Series, and many of the titles from our popular Mastering Skills Series. Finding extra time is one of the biggest problems I face in my classroom. I have found a way to add about thirty minutes to my weekly teaching time, and I really didn’t have to do anything hard at all; all I had to do was get rid of my clock. We all know teachers put a lot of time in preparing their lesson. One vitally important part of any lesson is the closure – where the entire period’s work is all pulled together so the teacher can get important feedback on how the lesson went. Each day I noticed when the class time would draw close to being done and I was ready to do my “all important” closure – my student’s attention spans were as finished as my class time nearly was. As the seconds ticked by on the clock showing only five minutes left of class, they began gathering their books, putting away their pencils, slipping on their jackets. Each and every day I lost the last five minutes of my class while they routinely packed up for the period to get ready for the next class. I realized if I could get that five minutes back each day that by the end of the week I would gain twenty-five minutes of valuable teaching time, if not maybe even a little bit more! So, I took down the clock. It didn’t take long for someone to notice. A hand went up. Of course the student wanted to know where my clock had gone. He seemed shocked when I told him we would no longer have a clock in the room. Now, I know what you are thinking – there are clocks on computers, students can wear watches, and in some schools students can even check their cell phones, but all of these are individual clocks. The one clock on the wall that all students focused on was gone. It was missing. It was no more. You see, when even just one student began looking at the clock, all other eyes would follow. The center piece of time ticking away was removed and with it, so was their wandering attention. At first the students complained, but their complaints didn’t last long. I cannot tell you how many students I’ve had say to me, “Time just flies when we are in this class.” Now, I’d like to, of course, take part of the credit for that by believing my class is simply so enjoyable that the time flies by, but I know that is only a small part of what they mean. When the students stopped being clock watchers, they became more engaged in what was going on in the room. When people are busy, time does go by fast. My students became busy learners rather than time watchers. I am on my fourth year of having a classroom with no clock, and I will never go back. When a substitute is invited into my classroom, I always leave a note or message to let him or her know where the clock is hidden. Sometimes I must pull out the clock for timed assignments or group projects that need a timer, but the clock never hangs from the wall. Each year as I get a new class of students, I wait to see how long it will take for one of the students to comment on the absence of my time piece. Most adjust quickly to the clock being gone, but there are always a few who cannot believe a classroom could exist without a clock. I even had one student go out and buy me a clock; I was quick to tell him how much I loved the gift and how I would proudly hang the clock in my kitchen at my house. Time is precious; time is much too precious to waste just watching it tick by and that’s a lesson even the students enjoy learning.